TUSCALOOSA, Ala. (WIAT)-- New Alabama basketball coach Nate Oats has been a busy man since being hired almost three weeks ago, but not too busy to make a public appearance on Monday. 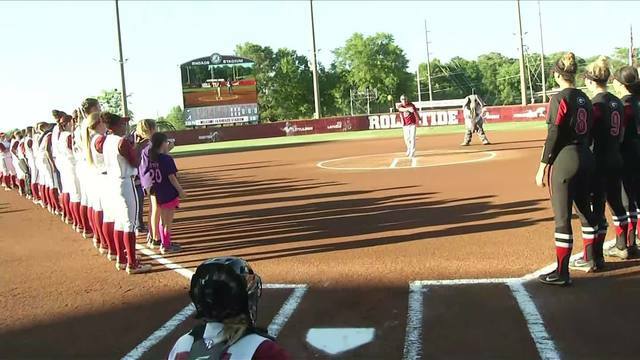 Oats threw out the first pitch at the Alabama softball game at Rhoads Stadium against Georgia. Over the past week Oats has finalized his coaching staff and is now trying to piece together the roster for next season. "I'm really thankful to everybody," Oats said. "It's been a warm welcoming. People have gotten behind us and the support in Alabama has been great." Oats took over on March 27 after Avery Johnson and the school decided to part ways. "We are going to put a product out there that they're happy to watch." Oats said. "It's gonna be a fun style of basketball to watch." Oats ended the interview with a "Roll Tide," already embracing the Alabama culture. Catch the full interview and first pitch above.